Even when the cupboards are bare and there isn’t enough in the fridge to pull together tea, you can guarantee one thing there will be in the house is condiments. 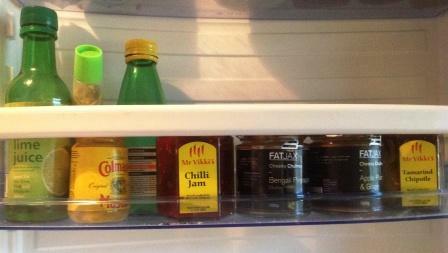 Chutneys, mayo, mustard and jams- I love them all. More often than not, they will have a dual purpose. Yep, they are great for perking up a packed lunch but many of my favourites. So, what’s on my shelves? Yes, I could have cleaned the shelves but decided to keep it real! Fat-Jax’s launched in Lancashire last year and their chutney’s have certainly hit the mark with me. Currently in the fridge are the remains of Apple, Plum and Grape. I cooked gammon in apple juice and spices and served with this on the side. Best ham/ chutney combo ever. The grapes give it better texture than your usual apple sauce and there is a bit of tang from the plum. The Bengali Pineapple chutney is awesome. I’ve stirred it through rice and dolloped on omelette. I also love it on chicken sarnies. Mustard is a must-have for steak and a creamy sauce for pork, and the lime and lemon juices make their way regularly into stir fries. You will always, always find some Mr Vikki’s in my fridge. Chilli Jam is award winning- the best chilli jam in the world in my opinion. I throw it into a beef chilli and on quesadilla with cheese and parma ham for the best toastie money can buy. Tamarind and Chipotle Chutney is a new discovery. I’ve spread it on wraps for three weeks solid with ham, salad, cheese or chicken. I also chucked some into my home made chorizo when I realised it needed more smokiness- and it worked! Hubby doesn’t like mayo which means I get to treat myself to the good stuff without it being snaffled. I buy this Harvey Nichols Lime and Tarragon mayo every Christmas. It has become something of a tradition for me now. Christmas is all about grazing and this mayo goes with all kinds of grazing food: chicken and stuffing sarnies, tuna salad, ham, cheese and crackers…you get the picture! 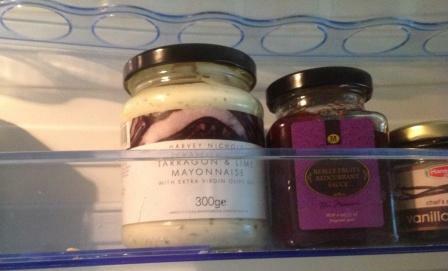 The condiment love-in continues in the cupboards. You’ll find mustard powder, ketchup, brown sauce (blurg-the devil’s condiment), Lea & Perrins and soy sauce. I love soy sauce with tuna – in fact as a student I went through a phase of putting it on everything, including chips! I think it’s the saltiness which makes it so addictive. There’s also a jar of apricot jam which I use for a Nigella chicken dish so gets classed as a condiment for this exercise! I don’t think a day goes by when I use at least one condiment- they can make or break a deal. Am I alone in my condiment craziness or do you have a favourite as well?